Below physical theatre students Bridget, Caden, Thomas, Sofia, and Tucket talk about some of their travels and upcoming collaborations they’re working on outside of class. As I returned from a long week dancing in Slovenia followed by beer, beer, and more beer in Munich for Octoberfest, I found myself very comforted by the fact I was returning back to the Accademia. As our cab putted up the steep hill and pulled up into the circle I felt an exceeding amount of joy seep out of my heart and fill up inside of me. The Accademia felt like home. At first living at the villa felt foreign, almost like I was living in a movie. A picturesque, almost fake looking scenic view surrounded me and at the end of the day I would sleep in a bed that was too firm for my liking and hear the creaking sound of the fan as I fell asleep. Until that moment when I saw the villa at the end of a long adventure away, the Accademia was all I needed to feel comforted. This is the place where for the past 5 weeks I had many laughs trying to navigate commedia, mispronounced many Italian words, scarfed down food at breakfast, lunch, and dinner, watched the most amazing sunsets off of the roof of the teatrino, and met and bonded with some of the most amazing people. It was a place of pure joy and love and I truly missed it. After being here at the Accademia for about a month now I have done quite a bit of traveling to many different places, places I had no idea I wanted to go to but walked away from loving every second of being there. Before you go abroad people always tell you how important it is to travel but what they don’t tell you is how stressful traveling actually is. This past weekend a few friends and I went to Munich, Germany for Oktoberfest which of course was a blast once we got there, but the travel time was terrible. 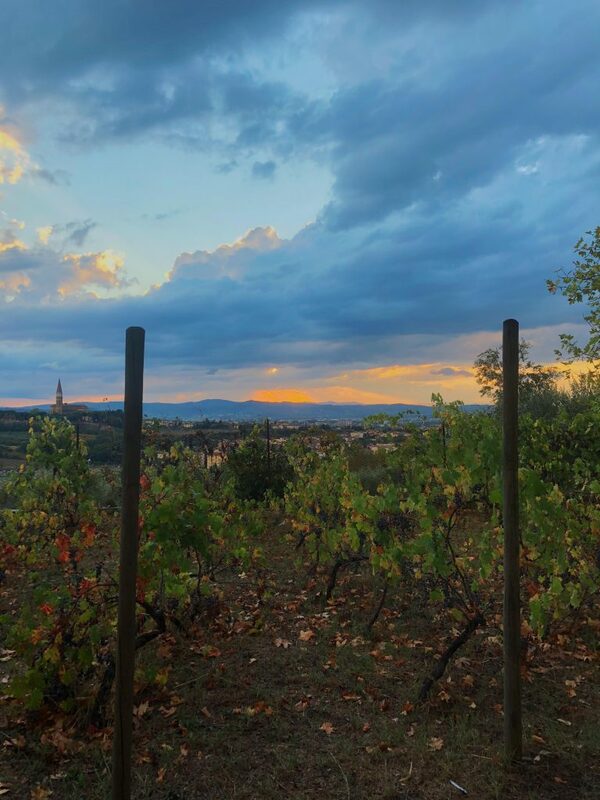 We had to take a six hour bus back from Slovenia, got back to the Accademia to then take a taxi to the train station and get on a high speed train from Arezzo to Florence. From Florence to bus picked us up and we drove 10 hours from Florence to Munich. We spent 2 nights there sleeping in tents with just sleeping bags, but it was a blast. After the weekend concluded we had to take that same bus back from Munich to Florence and we almost missed the last train of the night from Florence to Arezzo but made it with five minutes to spare. This is one experience I will never forget in how we really had to persevere to get through the weekend with all the traveling we had to do. Let’s just say I won’t want to be on a bus for a very long time. The preparation for collaboret – our first project, that we are performing on Wednesday – is progressing well and quickly – we have an amazing team of people who took responsibility for the preparation of the show from a technical point of view. Yesterday we first tried to build space for our piece and expose the light as it will be during the show, and it was easier to see everything from a completely different point of view. That helped us to find new ideas on how to make our piece better. It’s amazing how the theater, which is created by a team of various very talented people, does not allow you to dwell on yourself and the idea in your head and always creates something special and something else that you, perhaps did not expect, but that in its integrity it makes the work better. This week at Academia we are approaching the midway point of this semester abroad. And as expected, the culmination of the past five weeks has brought us all to the brink of exhaustion. 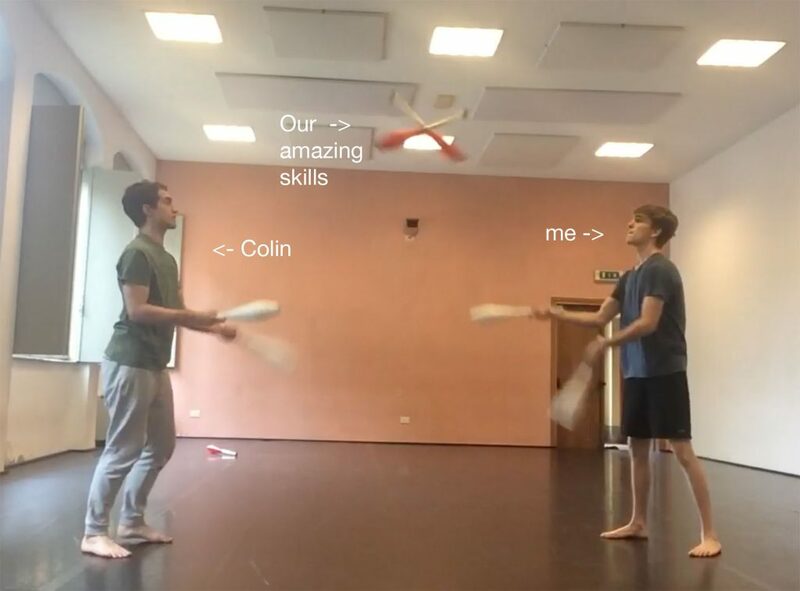 We each have multiple group rehearsals to juggle (including some literal juggling!) on top of readings, finalizing plans for fall break, and the very necessary task of personal hygiene. However, each haggard face still has a smile to offer the next and a hug at the ready. The family that has been formed here is something unlike I’ve ever been a part of. In the past week we have all been working intently on the “collabaret”, a little show for us to have the opportunity to explore our art by creating pieces together. It is a difficult task to coordinate over 40 people without a designated leader. However, even among inevitable tension, we are all still able to work together, sharing studios and supporting each other through feedback. At any point in the day (aside from the delicious hours of lunch and dinner, of course) the sounds of creativity emanate through the villa creating the most encouraging atmosphere to exist as an artist. I simply cannot wait to see the show that we have all created for each other!